When Honolulu Police Department (HPD) officers and City crews raided the deOccupy Honolulu encampment today to seize property tagged yesterday, they also came upon three protesters who had chained themselves to each other and to the tent flooring pallet. The "chain gang" was protesting the City's continuing use of Bill 54 (ordinance 11-029) to seize and destroy the belongings of the homeless. Press interview the deOccupy Honolulu "chain gang" after police left. Two -- Catherine Russell and Jehle Phillips were later arrested and released on bail. The police called for an ambulance and a firetruck, but the firemen to their credit refused to cut the chain gang out of their chains so they could be removed to jail. And the ambulance workers likewise refused that their ambulance be used as paddy wagon. 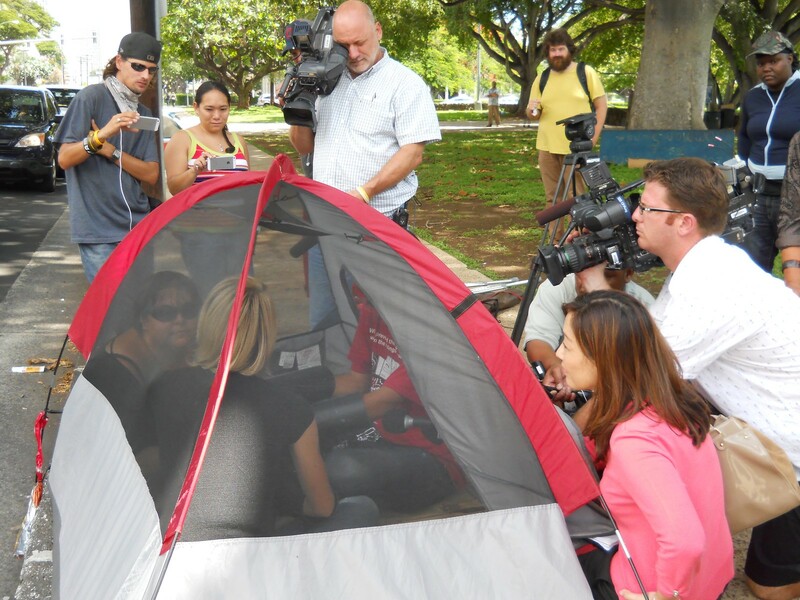 So the police left to raid the pop-up encampment that deOccupy Honolulu had set up at the University of Hawaii on September 17, as part of the worldwide Occupy Monsanto effort. That encampment had been moved temporarily to private property to circumvent the ordinance. The police did not even bother getting out of their cars at that encampment and left after being called out by the deOccupy Honolulu bullhorns. Shortly after the chain gang disentangled themselves, police swooped in and arrested two, Catherine Russell and Jehle Phillips at Thomas Square. They were charged with Obstruction of Government Operations and were released quickly on bail. I don't know if this case will present an opportunity to challenge the constitutionality of Honolulu's Bill 54, but it's worth speculating on. The 9th Circuit Court of Appeals recently found LA's version of the ordinance violates the Fourth and Fourteenth Amendments, but as Larry Geller points out, they had a lawyer. Stay tuned. In the meantime, deOccupy Honolulu plans to go ahead with their Off Art After Dark this Friday (9/28), a permitted event with live music, art, and of course, an open mic celebration of free speech. The better to preach the primary tenet of the group, the separation of corporation and state. Now, if these raids would stop for a while, I could get you my article on the goals and accomplishments of the group during the last (almost) one year! Click for a Flickr photo set of today's events. What was the whole point of changing themselves? I think you should post the goals and accomplishments instead of news about the raids. Honestly, I really don't know what you guys have accomplished besides being an eyesore. Is Wall Street still in the picture or has the focus changed over to Monsanto? doug, i finally found ur blog and repost onto various social networks, esp google+, where one of my friends is a retired hpd. youre doing a great job, and eventually i will return and do some solidarity camping again, this time with a fully working ipad mini (or ipod touch). ive been wanting to for some time but all sorts of stuff keeps cropping up, with various govt agencies mostly. each time im thinking, well, just get this handled and you can move forward. im beginning to think thats the wrong approach. im pretty sick right now, tho, and i do think getting healthy would be best before coming down there. it was so good hearing about the restraining order.